Wiola (AKA Wiolka, Wiolitka, Loletka and, dare I suggest, Wioletta – there’s seemingly no end to Polish diminutives…) is a young girl growing up in Communist Poland at the start of the 1980s. We enter her life as an important figure rejoins it, with the start of the novel marked by her father’s release from prison (another victim of the turbulent times). What follows is a series of short, fragmentary episodes from the young girl’s life, a Bildungsroman set in the bucolic idyll of Hektary. One day in the middle of July, my father got back from work early, and as he replaced the flypaper around the ceiling lamps, he said to my mother that martial law in Poland would end in a couple of days. Wiola is very much a part of this community, and her short, matter-of-fact descriptions allow the reader a glimpse into its lifestyle. 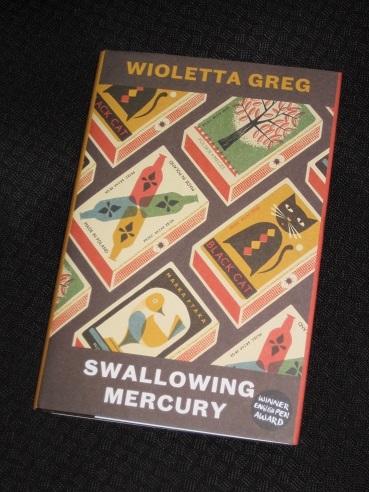 However, Swallowing Mercury also describes Wiola as an individual, not just as a member of her community, and one of the strongest aspects of the novel is the way it shows her development, and her growing disillusionment with her life. She appears to have slightly self-destructive tendencies (although clumsiness plays a major role here…), walking off in the lethally cold, snowy night with no real destination in sight, and stumbling over ladders, with painful consequences. The English title, rather different from the original, continues along these lines, referring to another incident from her childhood that could have had even more serious consequences. The early pastoral charm is also later overshadowed by darker hues, particularly when Wiola grows older and is exposed to behaviour of a sexual nature, ugly, scarring experiences which cast a pall over her childhood. There’s also a palpable sense of a connection between Wiola and her father, and it’s no coincidence that the novel begins with his arrival in her life. The first chapter shows how she reacquaints herself with him, and while he’s often in the background, his presence can be felt throughout – meaning that his health issues, when they develop, are likely to have a major effect on his daughter. This year’s longlist has been very strong, and there’s plenty of competition out there, so its chances were always pretty slight. I suspect that it was in direct competition with another book for the final spot on the shortlist (reserved for one of the lighter works considered) and lost out. I actually wonder if it lost out more by comparison to The Unseen as a fragmentary tale set over many years of a traditional way of life and Mirror, Shoulder, Signal got the nod for it’s more modern take on things.